XCOM: Enemy Unknown is one of the most played game I have in my Steam library. It rekindled a love with tactical games that I hadn’t felt since Front Mission 3 or Final Fantasy Tactics. The magic of these games (for me) had to do with the customization outside of combat, and the game of chess played out on the battlefield, where orchestrating your units strengths and covering for their weaknesses is highly rewarding. That feeling of properly equipping and coordinating your resources and executing a strategy play by play is a huge rush to a numbers nerd like me. Risk assessment vs. aversion, proactive vs. defensive, ranged vs. melee combat - figuring out which of these works best for a given situation and then adjusting on the fly for calculated losses or advantages on the field is an amazing sense of accomplishment. While XCOM broke the mold as to battlefield arrangement, dynamics, and presentation, there is still a common formula shared amongst them all. TASTEE: Lethal Tactics released with the promise of a unique approach to coordination in a tactical game; where the player is afforded a huge amount of detail as to individual character actions, and once all commands have been issued, the orders are executed in concert across all characters. So how does this unique approach stack up against the rest? The story goes that you are hired mercenaries working on behalf of the government to take down a crime cartel. The main menu between missions is your hub where you can check emails that helps flesh out character stories, and introduces available missions on the map. Once you've chosen your next mission, you assemble a team using any combination of 4-6 characters from an available 12 - split equally into 4 classes: Gunmen, Snipers, Shotgunners, and Bombers - each with their own unique special skill to accomplish a given mission to disrupt the cartel’s activities. The game and characters have a Team Fortress-y look to them, with cartoonish body shapes and bright, bold colors. Not much time is spent in the menus, as there isn't anything in the way of preparation or customization to address. The battlefield is setup like XCOM in that it’s not grid based; instead your character has a distance they’re able to cover (as well as actions to execute) in a 5 second time span. Each interval between those 5 seconds is your traditional “turn” where you’re able to assign movement and tasks to each character. Maybe you adjust their cover position, maybe toss a grenade, or maybe set them up in an “overwatch” type mode. You can do any combination of actions and decide what order they occur in within those 5 seconds provided, you just have to be cognizant of how much will fit in that time frame. That time span of activity also means you issue orders across your entire team before they will actually puts those orders into action. Since it’s all based on action in those 5 seconds, the enemy will also be moving to execute their strategy at the same time as your characters. You are able to preview each round to see your plan put into action and tweak as necessary, but there is no guarantee an enemy will remain where you currently believe them to be once you put your plan into action. The player is responsible for a high level of detail when it comes to each unit. In addition to movement or using special abilities, it falls to the player to detail things like adjusting the line of sight for your characters; it is critical that you ensure your characters is facing the right direction. If an enemy flanks you outside your LOS, you're dead; if you don't target an enemy within your LOS, your character won't fire at them; if your character isn't facing the right direction when they're moving into position and happen upon an enemy, they're a sitting duck. Crouching behind cover is also a specific action - if you move a character behind cover, but you don't issue the duck command, they are essentially in open ground and an easy target for a ranged enemy type. The order that these all happen in are also crucial - if you stand up from behind cover before adjusting line of sight, that may be just enough time difference for the enemy to take aim and take out your unit before they're able to turn around and return fire. You can also create way points where your instructions change. So the first action may be a sprint towards a way point to avoid open ground, switch to grenade toss, then adjust line of sight and overwatch, then move towards cover, and then duck behind the cover. Each one of these are actions that needs to be outlined at a specific way point. This is my biggest gripe with the game, and the reason I didn’t enjoy it much over my 15 hours of play. The need to address each specific action of your characters - movement, line of sight, ducking/cover, overwatch, special ability, and then specifically adjust when/where this all happens during the 5 second action windows - was tedious. I would spent 3-5 minutes on a turn (if not more), making sure to cover all variables for the unsighted enemies and progress towards objectives, adjust characters to orchestrate their movement within the 5 second window so they could cover one another, and all it took was a single sniper or grenade from an enemy popping out from cover to undo those 10-15 minutes spent on the 3 turns that actually encapsulate 15 seconds of actual gameplay. Nothing is more frustrating than feeling like you’ve covered all your bases with 4 players across 6-10 way points with 15-30 actions and ensuring that your strategy for these next 5 seconds was right, only to be undone by a single enemy because you didn’t adjust line of sight left by 5 degrees. You’re left with a huge investment of time and effort with little to no payoff. Although I wouldn’t quite characterize the game as such, the outcome sometimes feels cheap. You invest so much into a given turn, and for it to be taken away by a single misstep - when there are so many steps involved - is really, really frustrating. I invested the time thinking I would get better, but it never really felt like I did. Hour long rounds to complete a single mission didn’t feel worth it. I was restarting rounds if I lost a character within the first 4-5 turns knowing I was at too much of a disadvantage to complete the objective. 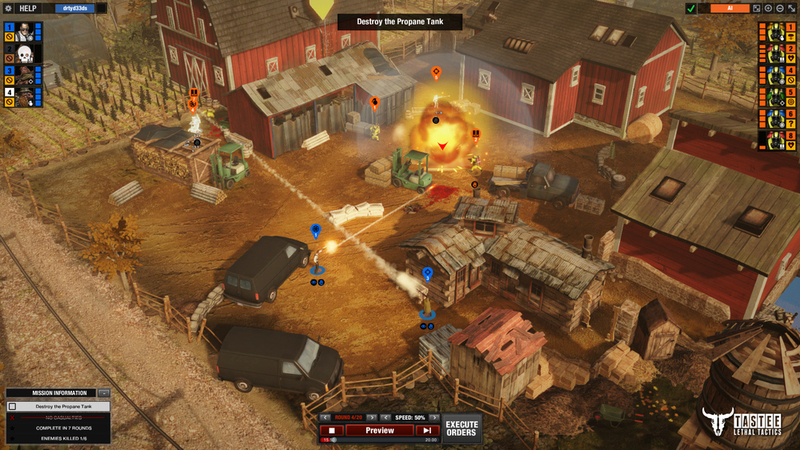 Most tactics games are played with rounds and game dynamics playing out as opposition is encountered. Things like cover and engagement is partially automated or fully turn based, so there are few “cheap” shots coming around a blind corner. It is a much simpler approach to be sure, but the high level tactics are still in play which is where the chess analogy comes in. TASTEE feels more like micromanaging a constantly changing production line; tactics only matter from turn to turn as drastic battlefield changes or losses suddenly find you unable to execute your strategy; after losing 25% or more of your resources, you're put into a highly disadvantaged position with little chance to regroup and/or defend. I invested over 40 hours into XCOM on Steam - easily that much into FFT and Front Mission 3 after multiple playthroughs. I still return to all of these games, and own them on multiple platforms. I gave TASTEE a fair shake, but after 15 hours invested, I found I wasn’t really able to enjoy myself or feel that the payoff was big enough to entice me to keep playing (A similar story can be made for Final Fantasy XIII, but that’s a story for another time). At the end of the day, the tactics genre is one where innovation and creativity are welcome - but complexity for the sake of complexity is neither. I struggle to find a situation where micromanagement is a positive thing, but it certainly wasn’t in this case. I applaud the attempts at innovation and creative new ideas, because there are some good ones in there, but the execution let them down.